It was about 5°C in Vancouver this morning and I was complaining about how cold it was. Just a few days ago, I was calling the -2°C temperatures in Yellowknife balmy. A shift in perspective, for sure! It was an amazing experience visiting the Arctic. In talking about the trip afterwards, I almost feel like I should be working for the Northern Canada Tourism Board! We didn’t take many photos because we completely forgot to bring a real camera and had to rely on iPhones, which struggled with the incredibly bright sunlight. Click on the images below to see the full-size pictures. We flew into Yellowknife in the afternoon and after picking up cold weather gear and checking into the Explorer Hotel, we headed out to see the sights. Our first stop was the underwhelming Northern Frontier Visitors Centre. At least they had a map of where to find the museum! 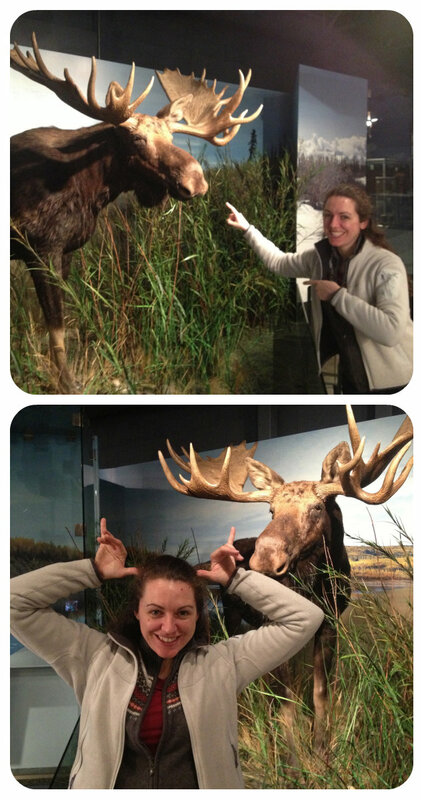 The Prince of Wales Northern Heritage Centre (aka the museum) was highly recommended and did not disappoint. In addition to a display about how locally mined minerals are used in technology (mostly to strengthen steel!) and some great wildlife dioramas, there were also samples of fur from most of the animals on display. Not surprisingly, polar bear fur is really thick and dense! Quite surprisingly (at least to me), musk ox fur is quite soft. Seeing how variable caribou hide is when tanned, cured, or left natural was fascinating. It’s a truly versatile material and I now totally understand how valuable the herds are to locals. Even though the museum opened in 1979, the inside of the building felt modern. Beautiful use of wood and lots of windows meant that it was bright and airy. Given that it’s named after him, the giant portrait of Prince Charles and the crazy jewelled sword made sense, but they still felt out of place amongst the taxidermied animals and rock samples. It was particularly strange to see a younger Prince Charles… and that he still looks pretty much the same. After getting a little too warm in the museum (it was about -20°C and we were dressed for outdoors! ), we walked downtown. Needing an afternoon snack, we stopped at Sushi North for a couple of rolls and some arctic char nigiri. Hopefully that won’t be our last experience with arctic char sushi – it was delicious! 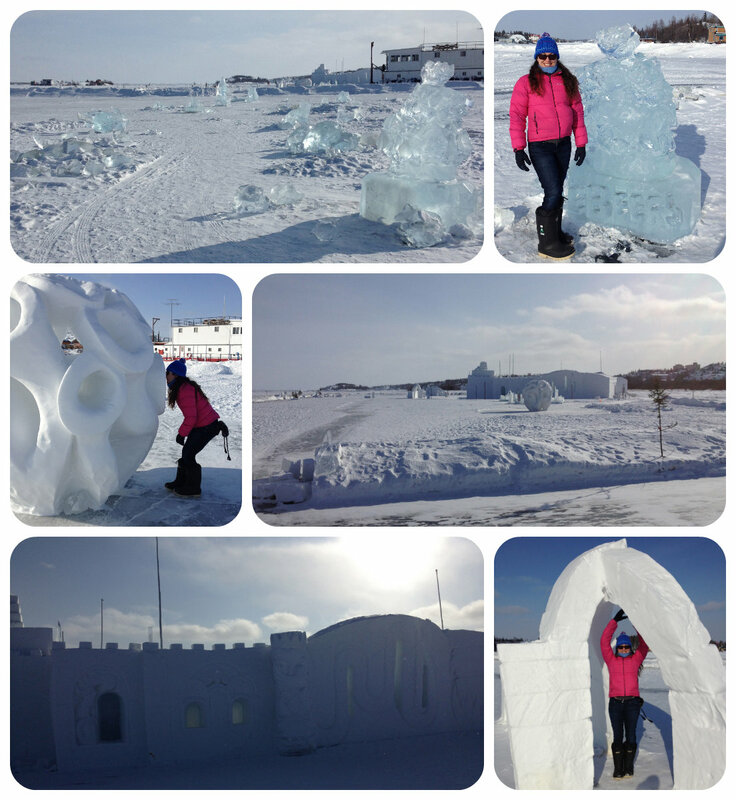 After polishing off a couple chocolate bars, we wandered down to the entirely-frozen lake and happened upon the remnants of the Snowking Winter Festival. Ice sculptures, a snow castle, and snow walls – all amongst brightly-painted houseboats! It was quite something standing on the lake looking down through the ice. Things don’t freeze that solid in the Lower Mainland! I really started to notice the cold after leaving the novelty of a snow castle behind and it was a chilly walk back to the hotel. We were impressed with how many people were walking home from work and even more impressed with the number of cyclists. Yellowknife seems like an active town and I suspect the adventurous souls who call it home aren’t about to let sub zero temperatures deter them. We certainly had different reactions to the polar bear in the Explorer lobby! Coming from Vancouver, where most residents are politely hostile to strangers, it was refreshing to have the people we walked past smile or nod in acknowledgement. Friendliness might be one of the benefits of having a population of about 19,000 instead of +1 million! While in Old Town, we came across the famed Bullock’s Bistro. It’s know for eclectic decor (diners are encouraged to draw on the walls), great fish and chips, and exorbitant prices. We elected to not venture out to Bullock’s for dinner and went to Trader’s Grill in our hotel. 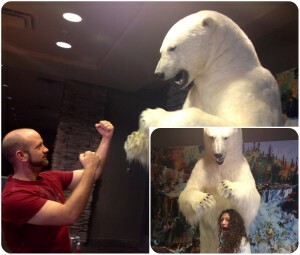 We couldn’t resist posing with the large, stuffed polar bear in the hotel lobby… I can’t deny how much I enjoy good taxidermy! Dinner featured some local fish and meats: smoked arctic char, musk ox dumplings, grilled boar. And it was all really good! I debated whether to try and stay up to see Northern Lights when dinner had wrapped up… but sleep won out pretty fast! We had a relatively late flight to site, so had the luxury of sleeping in and having a leisurely breakfast. 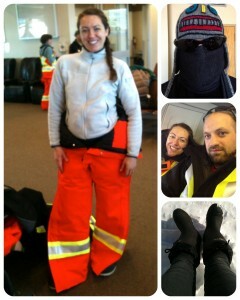 The logistics company picked us up at 10am and we carted all of our gear to the Yellowknife airport. All passengers on winter flights are required to wear full winter gear (snow pants & coat, gloves/mittens, boots), which is a hell of a lot of clothing for small airplanes! Thankfully, the logistics company arranged for pants, jackets, and boots for both of us so we didn’t have to purchase them ourselves. That being said, the gear was certainly not designed for women and wasn’t anything I would have bought myself. Size small was still pretty big and I ended up looping the straps of the pants around the back of my neck to shorten them and get them to stay up! 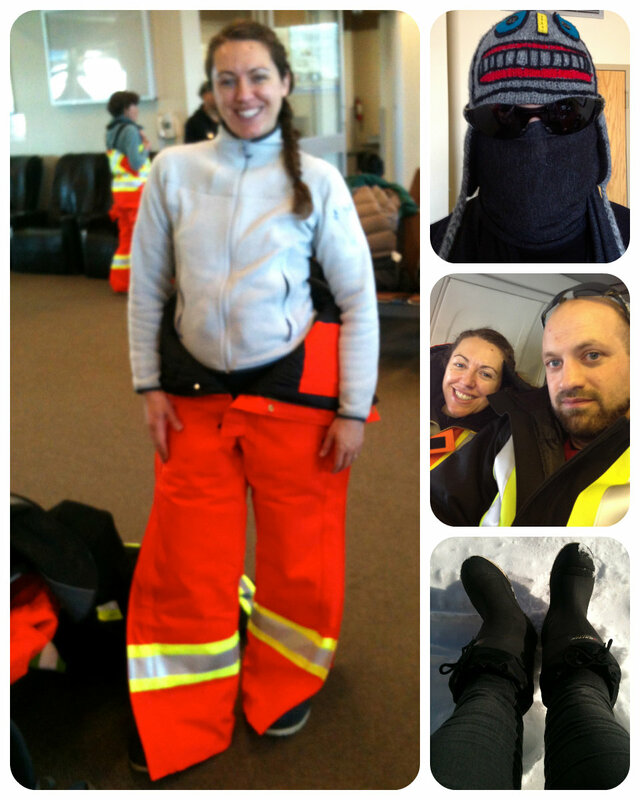 Being without winter gear was certainly not an option, though, and I wound up growing kind of attached to the outfit. The boots were awesomely warm and my toes never got cold. I was actually sad to let them go! The real purpose of the trip was to visit two camps in the Back River area of Nunavut. The first site we went to (Goose Lake, Nunavut) is about 500km east of Yellowknife. It took about 90 minutes on the Dash-8 and it was fascinating to watch the terrain change below us. The trees and all visible vegetation disappeared not far outside Yellowknife (apparently the treeline ends around 80km out of the city) and then there was nothing but the whiteness of ice and snow. 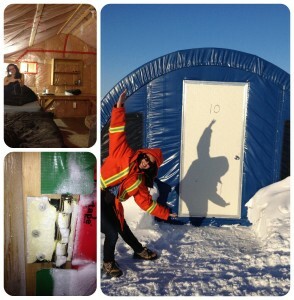 We landed on an ice runway and were whisked into camp. The concept of an ice runway is pretty foreign and mildly terrifying to me (the plane is landing on the lake! ), but it’s the norm in the north. Even though the ice was around 6 feet thick and more than solid enough to hold a plane, it still felt surreal! The ice runway is so solid that it can handle even larger planes than the Dash-8 we came in on. Later in the day, a Herc came in with supplies. Everything arrives at the sites via plane: fuel for helicopters and heating the buildings, food, machinery, building supplies. There is no other way to access these remote locations. Existence in the north is heavily reliant on weather and environmental conditions. Cold temperatures, precipitation, and fog all restrict the ability for air travel… and if aircraft can’t land or take off, that means nothing and nobody is going in or out of camp. The thought of being trapped in camp by weather in itself is enough to bring on a little bit of panic and cabin fever… and then the thought that most of the staff do rotations of 2-4 weeks in camp (with every day being a work day) and 1-4 weeks out, makes me feel even more trapped! The area around Goose Lake was markedly empty. The view to every side was flat and it made me think the jokes about being able to watch your dog run aways for days in Saskatchewan. In this part of Nunavut, it was flat enough to be able to watch a hare run away for days! The buildings at Goose Lake camp are all separate, which means going outside for everything. Want a cup of tea from the dining hall? Bundle up and head outside! Need to use the bathroom? First you have to go out into the cold! Have to see someone in a different office? Put on your coat! Our sleeping quarters were at the far edge of camp, which made any consideration of getting up to go pee in the middle of the night extremely unpleasant! Thankfully, the buildings themselves were toasty warm and after just a couple days I stopped bundling up quite so tightly for the three minute trek from our cabin to the dining hall or offices. The remainder of the day passed quickly as we talked to geologists and geo techs (geos), toured the camp, and visited a drill site. Goose Lake has a number of drills that operate pretty much 24/7 and there’s also a project to create an all-season runway so larger planes can come in throughout the year rather than being confined to the ice runway. The food at camp is top-notch, which is more than incredible considering the conditions. The kitchen staff works hard to keep everyone happy and I was amazed at the variety and quality of offerings. They also have to accomodate differing schedules as half the drillers start their workdays at night. The second day we were at Goose Lake, I got to help out with a wolverine survey. There’s a fair amount of wildlife around camp (arctic hares, wolverines, wolves, caribou) and the company wants to monitor the environmental impact of their mineral exploration and development activities as well as enable better understanding of local animals. Our day was delayed as the morning temperature was -37°C and it needed to be warmer than -30°C for the helicopter to take off. So much for a 7am start! The temperature warmed up enough around noon and I headed out with an environmental tech and the helicopter pilot. We stopped quickly at the George Lake site to drop off a couple passengers and then carried on with our wildlife-based mission. I’d only been on commercial helicopter flights between Vancouver and Victoria before, so this was a very new experience. 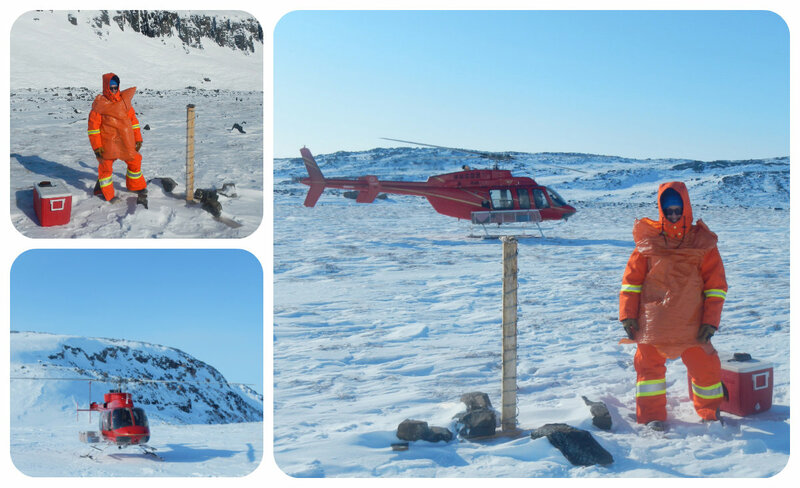 The helicopter set down at about a dozen sites and the enviro guy and I hopped out to collect samples and re-bait. Each post was wrapped in barbed wire and topped with a piece of fish. The animals would climb the post to get the fish and the barbed wire would trap bits of their hair that could then be sent for DNA analysis. Thankfully, we saw no live wolverines. The stuffed one at the museum was scary enough for me! We did see a falcon and an arctic hare from the helicopter. Both of them were moving damn fast! We spent about four hours in the helicopter and it was a much more exciting ride than going between Vancouver and Victoria. The pilot swooped and turned in order to spot the posts and at points I realized that the ground was no longer below us… it was beside us! Even though the two sites are quite close to each other (30 minutes by helicopter, roughly 70km) the terrain around them is different. Goose Lake is flat – really, really flat. The area around George Lake has hills and exposed rock and visibly coloured lakes. Even when frozen, I could see the aqua and deep blue of the water near George. The landscape reminded me of a beach, but with snow instead of sand and no ocean in sight. It was so vast that it seemed endless. We got back to camp around 5:30pm, just in time to get a prime viewing location for the blasting. In order to level the all-season runway at George, they’re making their own gravel at site by blasting the ground and then using a crusher (a huge expensive piece of machinery) to create smaller rocks. The gravel will then be used to fill the low spots in the runway and will continue to be used to expand camp as the project moves towards being a producing gold mine. Another delicious dinner (bison roast!) and then a fairly early night. Yellowknife and the Back River camps are on mountain time (like Edmonton) and it felt as though the sun rose and set earlier than in Vancouver. The sunsets were crazy long with light remaining along the horizon for at least a couple hours after the sun had dropped out of site. But when it did get dark… it got really dark. Standing outside our cabin with just the lights of camp behind us, the world felt enormous and empty. The camp lights made it a little harder to see the stars, but it was obvious that the sky in the arctic is somehow bigger than in Southern BC. The next day we were scheduled to go from Goose Lake to George, but the weather had other plans. Low-lying fog and blowing snow created near white-out conditions that made it impossible for planes to come in and dangerous for the helicopter to fly. The weather the next day was warmer (ranging from -19°C to -11°C), but the visibility was still terrible. A plane flew out from Yellowknife and made it to Goose Lake, but couldn’t land as the pilot couldn’t see the runway and had to go back to Yellowknife. We could just barely see the plane through the fog and everyone on the ground was very disappointed that the conditions had forced the flyover. While Goose Lake was fogged in with terrible visibility, the George Lake camp was bright and sunny. Around 4pm, the helicopter pilot determined that conditions were good enough to get us over to George and bring back a few people who had been stuck at the smaller camp through the bad weather. When we took off, the ceiling was around 300 feet and visibility was seriously limited. I was glad that I’d done the wolverine tracking with the pilot and felt really comfortable that he had the skills and experience to fly safely. About five minutes into the trip, the clouds and fog disappeared entirely and we were treated to bright sunshine. Staring out across the tundra again brought on the sensation of vastness. The arctic is huge and it just a part of a planet that is really enormous and full of amazement. Roughly 30 minutes after departing Goose Lake, we arrived at the George Lake camp. George is substantially smaller than Goose and many of the buildings are connected – yay not always needing to walk outside! Sadly, the women’s washrooms and our ‘tent’ were among the unconnected buildings. At least it had warmed up substantially. I even got the camp tour without needing a coat! My sweater, jeans, and, now-beloved snow boots were warm enough. While walking to the women’s washroom from our ‘tent,’ I spotted a moving flash of white – an arctic hare! It dashed away pretty quick, but it was still pretty neat to see one from just a couple metres away. If it’s possible, the food at George is even better than at Goose. After another great dinner (I feel like I did little more than eat while in camp – for very good reason! ), we sat in on the weekly safety meeting. Another wander around camp (it takes little more than 10 minutes to walk the footprint of the George site) and we returned to our ‘tent.’ There was still light on the horizon at 10pm and we saw a hare prance from the sleeping tents across camp. Huge white fluffy coat – tiny little legs! I imagine they’re crazy lean under all that fur. I managed to stay awake until 1am and we bundled up in hopes of catching a show. We had excellent timing and watched the Northern Lights for about 20 minutes. I’ve seen them before in Northern Alberta, but the experience in the Arctic was so different. The darkness of the sky seemed bigger and higher. If the sky feels 100km away in Vancouver, it felt like 150km in Northern Alberta, and it was 1,000km away in the arctic. Huge, enormous, endless. The Northern Lights swept from horizon to horizon, peaking right above us and towards the right. They were mostly white, with hints of green and yellow and a little purple. Pastels appropriate for spring. The soft brilliance of the light reminded me of the colours that filter through stained glass in sunlight and diffuse across the floor. After our ears adjusted to the constant hum of the generator, we could hear the Northern Lights. I’ve heard them crackle before, but this was a softer sound. More like the rustle of a taffeta ballgown than the snap and pop of a campfire. The lights shifted and swayed. And I needed to remind myself that they were not CG. No one had designed them using a software program, they were just happening. Just as the cold started to become too much, the activity began to die down. We retreated to bed and I slept soundly, feeling exceptionally lucky to have caught the Northern Lights on our last arctic night. Several planes were supposed to go through Goose Lake the day we went to George, but only one was able to land around 10pm that night. Thankfully, all of the staff who were supposed to leave on Monday (generally, people go in and out of site on Mondays and Thursdays) were able to get back to Yellowknife and continue their journeys home. We left George Lake on a Dornier (an aircraft I had never heard of before), fully clad in winter gear and feeling more than a little squished in the small plane. On the 120-minute flight to Yellowknife we passed over two diamond mines: Diavik and Ekati. It was pretty neat to see where Canadian diamonds actually come from. We arrived in Yellowknife several hours before our flight south. After depositing our winter gear with the logistics company, we headed to the Black Knight Pub for lunch and a couple pints. A quick cab ride to the airport from downtown and we were headed back to Edmonton. The bright clear weather continued until just outside of Edmonton and provided incredible views of Great Slave Lake and all the little lakes that dot the landscape. Minnesota may be the land of ten thousand lakes, but the Northwest Territories seems like the land of a million lakes! We were in the arctic for just five days (one night in Yellowknife, three at Goose Lake, and one at George), but I felt like I adjusted quickly. The tremendous brightness of the blue skies, blazing sun, and reflection off the snow stopped being so dazzling and the cold felt more manageable. I certainly would love to see what the areas like in the summer and this trip sparked my interest in visiting Whitehorse and comparing the mountainous terrain there with the vast tundra of Yellowknife. I knew that the trip would be unlike anything I’d experienced before. I didn’t realize that it would change my ideas of what Canada is and that I would be so impressed by the arctic.